Quail is very tasty and addictive. Chinese often do them I think sort of barbequed with char sui sauce? Divine! Aw now my mouth is watering. These new larger type quails seem pretty fast to put meat on I must say. Almost makes me want to try breeding them again, although the males are quite noisy unless you had a very large block. We have them on the verandah within metres of the house and the young males are not noisy at all. Maybe that happens when they are older as our youngsters are only five weeks old. If they get noisy, they get smoked. We have just one mature male and that's all we need. We hear him 'crow' about once a day. Not really a problem at all. I have been told that you get more noise from them if there are a few mature males so we won't do that. I must say, they seem very easy to keep and grow for home-grown meat purposes. Very nice Wright up. Plucking quail takes time I will be looking into a plucking machine to use when I get mine. please keep us up todate with smoking them. What smoker are you using? I have a smoke box that I place in my BBQ with a range hood. I also have a metho header so that smoke is produced while maintaining a lower temperature in the BBQ. 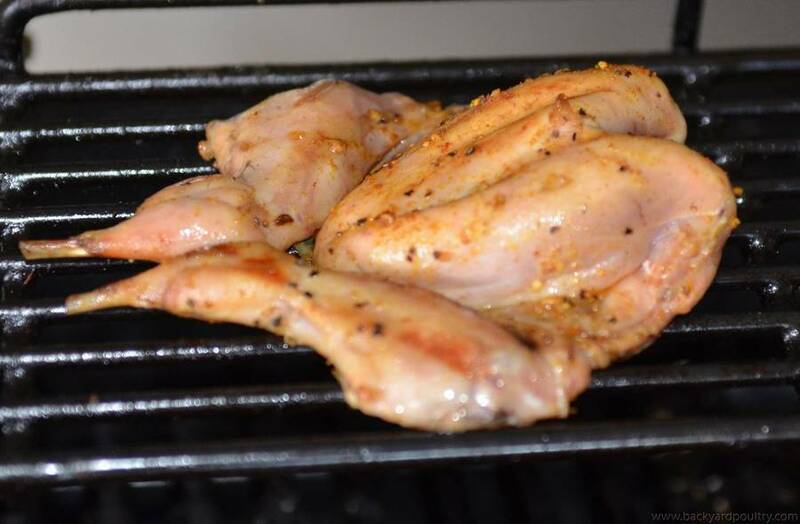 The quail was then cooked on a low temperature for 1 hour at 150 degrees F. It was put into a tray with a little water in the base to stop it from drying out. You can see how white the meat looks when pieced. 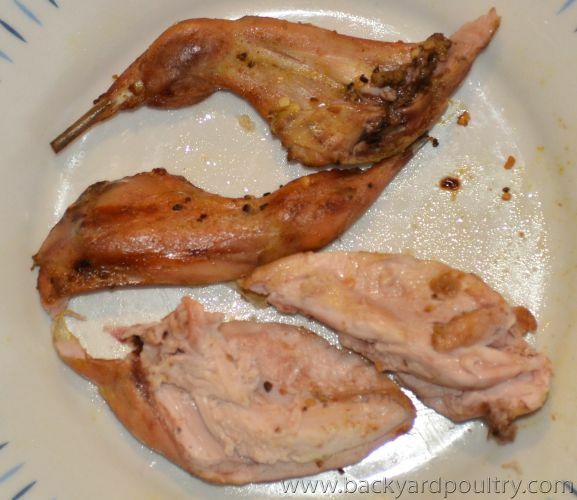 i cut the quail in half and simply pealed the breast off the ribs and discarded the carcase. This quail tasted like mildly smoked chicken. It was very moist, and extremely palatable. 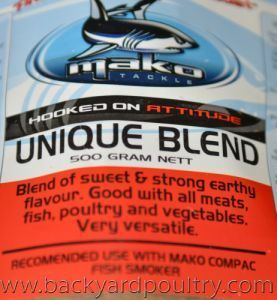 It could have been smoked for twice the amount of time to give it a more distinctive flavour. However, I successfully smoked most of the washing that was hanging on the verandah at the time. Note to self, next time remove washing prior to smoking. I used a mixture of the two smoking mixes pictured below. 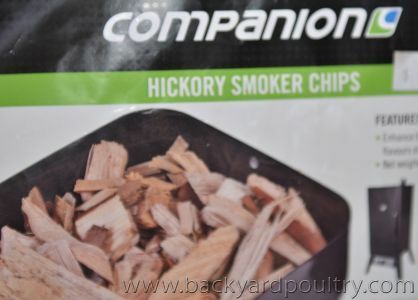 The first is hickory wood chips and the second is a blend of sawdust soaked in wine that tends to produce more smoke at a lower temperature. 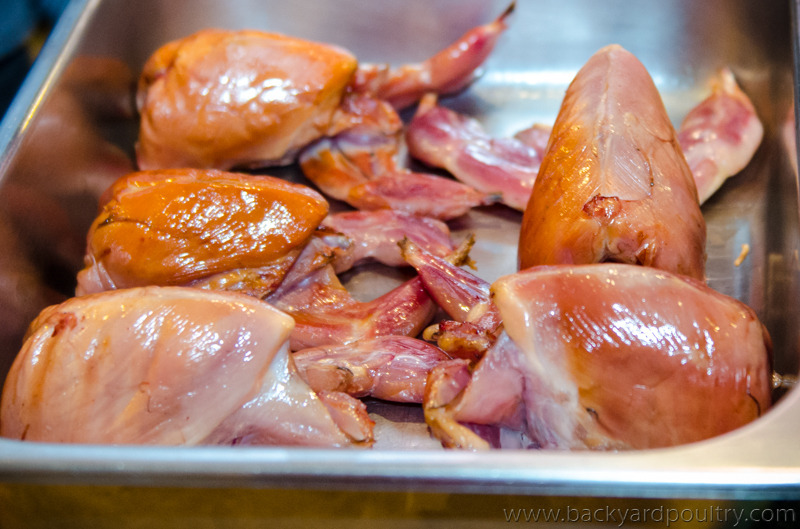 Just dressed 9 quail for tomorrow night's dinner. The live weight was 3 kg. The dressed weight was 1.64kg. This equates to an average of about 180g per serve. I am going to cold smoke them, then wrap them in Proscuito and BBQ them. I'll take some shots when they are ready to cook. I got a photo of some of them after the cold smoking, but not after the next part. Following this they were wrapped in the proscuito, dipped in a honey soy glaze and then barbecued. There were no complaints. We found it easier to eat them with fingers than with a knife and fork. I know it was skinned But if one wanted to pluck instead how fiddly would that be? Ten times less effort than plucking chooks which makes up for how fiddly it is, if you're keen to keep the skin on. Japanese quail have very soft feathers that pluck easily... although be gentle as the skin can also tear if you go at it like you would for a chook or duck. Although there is plenty of advice out there to scald them before plucking, it's really not necessary, IMNSHO. I found that it's far more fiddly to get the last of the feathers off chooks because they're so tightly attached than it is to get the last of quail feathers out as they just about fall out in comparison. Bear in mind that I never do more than about five or six at a time (I do the kill & the plucking or skinning, plus removal of head & legs, and then hubby does the rest), as I can only deal with that many before the entire process & what not gets to me. I find it kind of therapeutic to pluck them, even though I tend to skin them now (sometimes after partially plucking for the effect). Skinning's just so much quicker & I'm not fussed about the skin. Still much easier to skin them though ! We've always skinned or plucked before cutting legs off, and hold their legs whilst skinning / plucking. We first tried gutting them as with dressing a chook, but that's VERY fiddly, so we do the butterflying thing like Cathy & Ben. 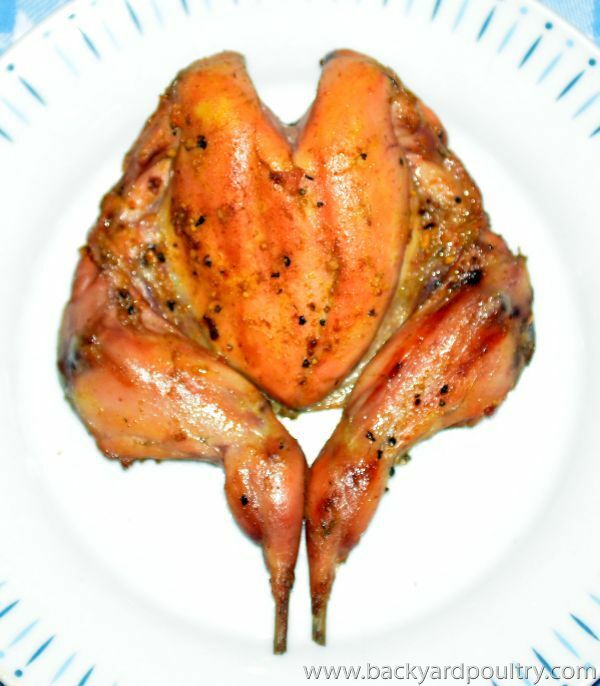 If you find someone with little hands prepared to gut them, a whole gutted quail raised by yourself is a great sight. I did a few last year. Plucked them and then gutted them. Plucking was quick and easy and because I have long fingers was easy to gut them. I found them easier to gut then the bantam Sussex I did not long before. After letting them set I knocked up some stuffing wrapped them in bacon and then cooked them up. They tasted great.